This is bad–an unprecedented infringement on freedom of the press based on the bad faith actions of law firm Carter Ruck and the alleged toxic waste dumping of the Trafigura Company. Includes a paragraph on sixteen-inch aluminum “transcription records,” which ran at either 78 or 33 1/3 and were used to play back performances for radio broadcasts–this is the kind of record that the Virginia Glee Club recorded in 1933. This post is one of an ongoing series on the history of the Virginia Glee Club. Today, I heard something that hasn’t been widely heard in about seventy years: a recording of members of the Virginia Glee Club made in 1933. Prior posts in this series have focused on the period from the 1890s to the early 1920s. (For a reminder: 1871, 1893, 1894 and the 1894 tour, 1906, 1910, 1912, 1916-1921, and a survey of directors from 1878 to 1989.) The trail of historical evidence about the Club goes a little cold in the 1920s–perhaps because the Club became, during this period, a full-on curricular option under the direction of the first head of the newly formed Mcintire Department of Music, Arthur Fickénscher. Things … quieted down a bit. There’s no indication of more musical theatre performances and precious little press coverage, aside from a performance at the creation of the Thomas Jefferson Foundation in 1923. In the early 1930s, things changed, and as so often with the group, it happened with a change of director. Fickénscher grew up in California but was tied to the European tradition, having both studied and taught in Germany; his successor, Harry Rogers Pratt, was a colorful man who was all American. In the 1930s the Club started reaching out again: performances at various high society gatherings at the Greenbriar (1932) and Hot Springs (1933, 1934, 1935), performances in New York for the Club’s 50th anniversary in 1936, and a much publicized tiff with Wagner in 1939, in which the boys of the Club on the eve of world war refused to sing the original words of the final chorus of Die Meistersinger and its praise of the German masters of the art of song. And now, we know, the group was branching out in other ways as well. 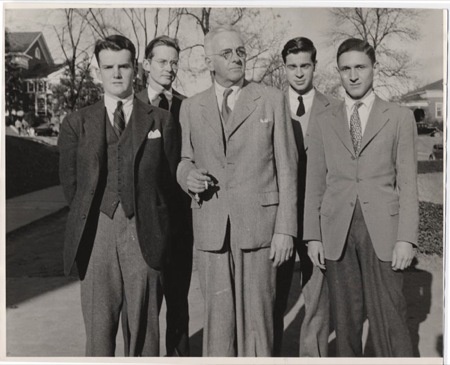 As I trolled the catalog of the UVA library in search of more clues to the Glee Club’s past, I found a recording I had never heard of, by a group I had never heard of–the Tin Can Quartet of the Virginia Glee Club, on a 16″ aluminum transcription record from 1933. A further Google search for the group turned up exactly one reference to them–in a presentation from the preservation department at UVA. And a contact to the author turned up two MP3 files, all that could be recovered from the record.